The Chiefs couldn’t stop an unknown running back Sunday, and because of it they may have just played themselves out of the playoff race in the AFC. Despite two TD’s from Jammal Charles, the Chiefs couldn’t hold Cardinals back Kerwynn Williams in check, and lost in Arizona 17-14 in a game they had to have. Williams, a seventh-round draft pick of Indianapolis in 2013, revved up what has been a sluggish Arizona running game. He carried 19 times, averaging 5.3 yards per carry. The Cardinals had rushed for 99 yards in the last two games combined. They got 141 on Sunday. He outgained Chiefs back Charles, who had a 63-yard touchdown on Kansas City’s third play from scrimmage. He went to the locker room after turning his ankle in the second quarter, but returned quickly to turn a short catch into an 18-yard touchdown that put the Chiefs up 14-6 at halftime. The Chiefs (7-6) were one of the NFL’s hottest teams just a few weeks ago on the heels of a five-game winning streak. A tough-to-take loss to winless Oakland set Kansas City back and last week’s loss to Denver knocked the Chiefs out of the AFC West race, clinging to wild-card hopes. 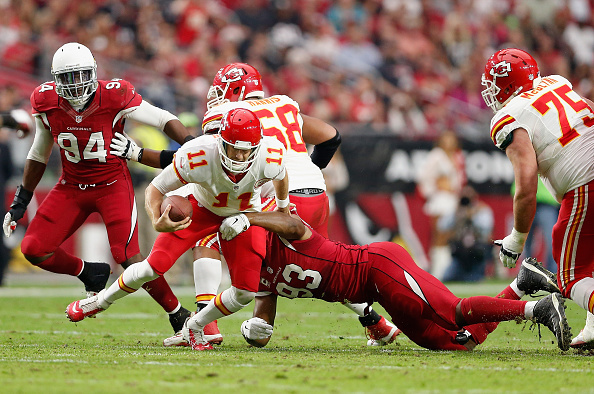 The Chiefs defense held its ground against Arizona in the first half, holding Arizona to a pair of field goals by Chandler Catanzaro, who also sent a 36-yarder off the upright to close out the first half. After struggling early, Cards QB Drew Stanton started to find a rhythm late in the third quarter. He hit Michael Floyd on a 45-yard pass to set up Catanzaro’s third field goal, then found Jaron Brown for a 26-yard touchdown that put Arizona up 17-14 in the fourth quarter. Worse for the Chiefs on the Brown touchdown was what came right before. Tight end Anthony Fasano hauled in what appeared to be a 19-yard touchdown, but was called for offensive pass interference. On the next play, Alex Smith threw a wobbly pass that Alex Okafor intercepted and returned 26 yards to Kansas City’s 42-yard line. “Quite a swing on two plays,” said Smith, who threw for 293 yards and a touchdown on 26-of-39 passing. Kansas City crossed midfield late in the fourth quarter, only to turn it over again, this time on a disputed play. Chiefs tight end Travis Kelce was originally credited with a 19-yard catch, but the officials ruled after review that he fumbled after being stripped by Deone Bucannon and Arizona’s Justin Bethel recovered. Catanzaro missed a 39-yard field goal on the ensuing drive to give the Chiefs a final chance, but they turned it over on downs to put the playoffs that much further away.